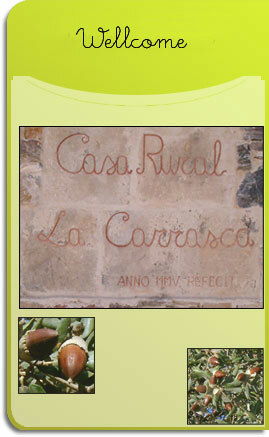 La Carrasca is a 100 years old country house situated in the middle of “Vega Baja del Segura”, Alicante. It is fifteen kilometres from Catral. The house was restored in 2005 and it maintains its rustic features. Now it retains its country house charm and the comforts of the XXI century. This house is set within 2500 m of fenced in land, where many different trees drow (cork, palm, orange, pine and lemon trees). It is ideal for children to play, too. There is also a small organic garden and a hen house, its produce is openly available for visitors to use. Next to the house there is a barbecue with two “paelleros” (pans for cooking paella) and space for parking. The house is centrally heated. It contains both refurbished antique and modern rustic furniture. There is a collection os paintings based of Greek mythology, painted by Fermín Navarro, a painter from Catral. The house sleeps 18 and it is divides into two adjoining parts. Altogether it is a place where you can relax and enjoy a rural atmosphere near the beaches of Alicante.